From the East: Exit M65 at junction 12 and follow signs to 'Burnley North A682,' over two roundabouts and into Colne Road. After 1.5 miles, turn left at the lights into Casterton Avenue. After another half mile, go straight on at another roundabout, follow signs for 'Rochdale A6114,' into Eastern Avenue. After 1.5 miles, you will be on Belvedere Road and the stadium is there. From the West: Exit M65 motorway at junction 9 (Signposted Halifax A679) and turn right at the first roundabout, over the motorway. Go to the second roundabout and take a left, still following signs for Halifax and onto Accrington Road. After ¾ of a mile, go right at the traffic lights, into Rossendale Road. Follow for another 1.5 miles and then go straight on through the traffic lights into Glen View Road. After another mile, turn left into Todmorden Road, where you will find Turf Moor. From the North and South: Exit M6 at Junction 29 and onto the M65. Exit the M65 at junction 10 and follow signs for 'Towneley Hall.' This road eventually goes past Turf Moor. Advantage: Close to ground, 5 minute walk, illuminated. Millennium NCP, Brown St, BB11 1PZ. Advantage: Town centre location, close to all the shops and fast food outlets. 8 minutes walk from the stadium. Deanmill (Plumb St) Car Park, BB11 3AG. Advantage: Close to stadium, new car park, secure, well lit. 4 minute walk from stadium. Aircelle Ltd, Bancroft Ave, BB10 2TQ. Advantage: Away from city centre traffic, close to motorway after the game ahead of traffic flow. 15 minute walk or hop on local bus (3 minute journey). Rail: The nearest station is Burnley Manchester Road. From here, exit the station and walk down Centenary Way, from here, Turf Moor is clearly visible. When you reach the roundabout at the bottom of the road, go right down Yorkshire Street, which becomes Harry Potts Way and the ground is on your left hand side. From Burnley Central, follow signs for the Town Centre and then head left towards the 'Gala' Bingo Hall. From here, walk down Yorkshire Street and use instructions from above. Bus Routes: The Bus Station is situated relatively close to the ground, just off Centenary Way. Leave the station and turn right towards the Gala Bingo Hall and go under the aqueduct onto Yorkshire Street. Then, follow the instructions from above. The clubhouse at the Cricket Club (you can also park there) is open on matchdays and visitors are always made welcome (wearing colours).The Queen Victoria (Brewers Fayre establishment) is no more than 10 minutes walk away. The Bridge Bier Huise pub is around ten minutes walk away from the ground, serves good beer and food and is fine for away supporters. This pub which is in the centre of Burnley is listed in the CAMRA Good Beer Guide and in addition to a number of real ales, offers a large selection of bottled beers from around the world. A fortnight ago, we were expecting this match to be billed as Claude versus Claudio. In that time, both managers had lost their respective managerial positions and this would be the first viewing of Brendan Rodgers’ side at home. 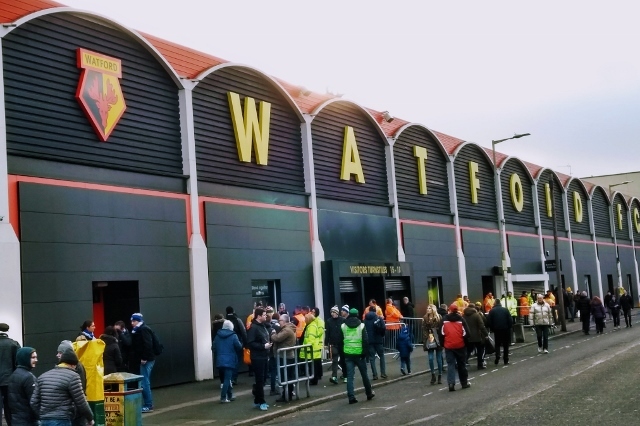 After his experiment of a 3-5-2 formation against Watford, fans were expecting to see a similar set-up against Fulham, a side not renowned for its away record. Instead, the new manager reverted to a back four and one holding midfielder. After conceding a second corner within four minutes, City fans were understandably becoming twitchy and wondering whether we would (yet again) be letting in an early soft goal. On this occasion – no. The visitors rarely made any impression into the City half for the rest of the first half. This was due a lot to Ndidi’s impressive tackling, blocking and intercepting. Indeed, after twenty minutes, he stole the ball from Chambers and immediately threaded it through to Vardy, who, using his speed, took it into the penalty area and, seeing Tielemans unmarked, crossed it to him. The Belgian took one touch with his right foot to give him space past the defender and rolled the ball into an empty net. By this stage, the goal scorer could have had a hat-trick as he had tried two attempts on goal earlier. The build up to the goal was all the more impressive as Vardy was “on” to score his hundredth goal for City, and his unselfish play had given City the lead and a comfortable platform to continue the first half. 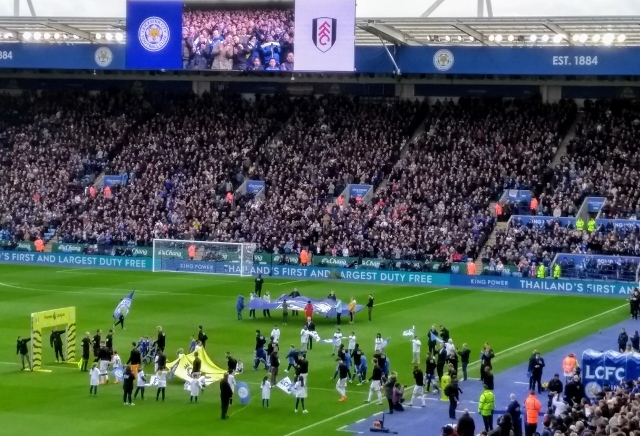 It was evident that City had been given instructions to play higher up the pitch as there was back-up to Vardy’s attacking position on many occasions and with more luck or poorer Fulham defending City could have had a bagful of goals by half-time with attempts from Maddison, Vardy, Pereira, Barnes and Evans, who nearly scored with a dramatic diving header at the end of the half. Defensively, City seemed hungrier for the ball than Fulham and were hunting in packs of two or three to retrieve the ball from Fulham midfielders, thereby stifling any of their attempts to move forward. City fans were happy at half-time but slightly frustrated that the dominance had not made the game safe by that stage. Fulham, meanwhile, looked rudderless and the lack of a permanent manager was noticeable. 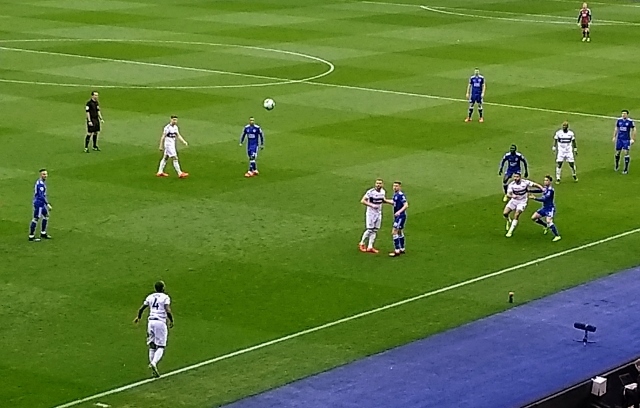 However, Scott Parker, temporarily in charge of the Cottagers, decided that this City dominance could not continue and brought on Ayité after the break to replace Sessegnon, who had been unimpressive against Chilwell and had given the latter too much space down the left-hand side to support Barnes’ attacks. This change brought swift reward for the visitors. After about five minutes of the restart, they booted a high ball out of defence which looked as if it might be going out for a throw-in. Ayité judged the flight of the ball better than Chilwell, who seemed to dither, waiting for a throw-in to be given. Instead, Ayité controlled it perfectly and turned Chilwell easily and darted towards goal with the ball. As he entered the penalty area, his shot on goal was spotted by Schmeichel and he was ready to stop it. 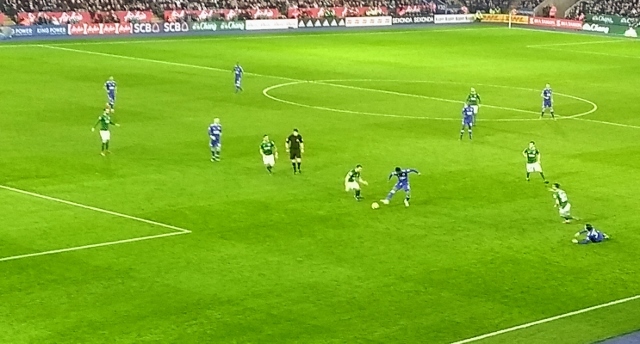 Unfortunately, the tame shot hit Maguire and trickled pathetically into the net leaving Schmeichel wrong-footed. The tame goal that City usually give away in the first ten minutes of the first half came at the beginning of the second half this time. This rejuvenated Fulham who suddenly decided that attacking City was an option after all and for the next twenty minutes they looked the more likely to score. Mitrovic, who generally had a quiet game, could have given them the lead on 67 minutes when a perfect cross from the left found him unmarked between Evans and Maguire. His deft header trickled past the far post with Schmeichel beaten. Our midfielders did not have the same control shown in the first half. On occasion two blue shirts would go for the same ball, get in each other’s way and Fulham would come away with it. Ndidi certainly did not have the same effect on the game as in the first 45 minutes. Gray was ineffective on the right wing. Tieleman’s passes were not as incisive as they were earlier and City looked tired going forward. Rodgers made a double substitution on 70 minutes bringing on Okazaki and Ghezzal to replace this duo. 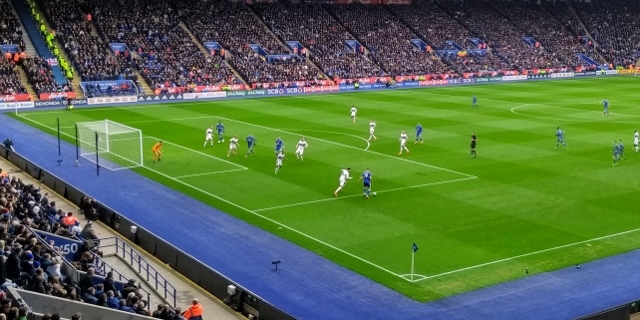 Several minutes later, Maddison intercepted a poor clearance from Nordtveit and from the centre circle passed a perfectly weighted ball into space on the right of the penalty area for Vardy to run on to. This time, he took his chance with an immaculate shot into the far corner of the net. This settled the home side and after a further substitution whereby Mendy replaced Maddison to solidify the midfield there was only going to be one winner. Most of the fans sitting around me have been impressed with Harvey Barnes since his return from West Bromwich Albion. His positive runs towards an opponent’s goal have been exciting and penetrating. He deserves a goal. Earlier in the second half we thought he had one. He received the ball from Chilwell on the left hand corner of the penalty area and curled it wonderfully towards the far post. Unfortunately, Rico was equal to it and dived to his left to palm it away for a corner. The next best thing to scoring a goal is probably creating one and in the 83rd minute, Barnes controlled the ball well on the touchline and turned for goal. Odoi’s attempt to bring him down was brushed aside and he ran into the penalty area where he saw Vardy loitering with intent. Vardy’s earlier unselfishness was rewarded when Barnes slipped the ball to him and he guided it into the net with his left foot. 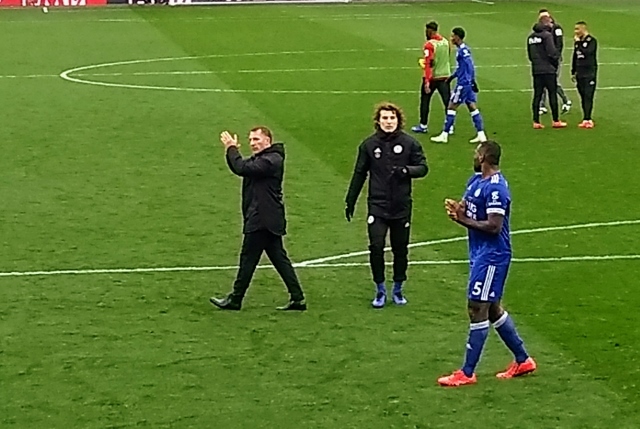 There was some doubt from Radio Leicester after the match as to whether the first or the second of his goals was the 100th for City – he had made sure one way or another that this milestone was reached. The end scoreline suggests a comfortable win for City and in many ways it was. Yet the wobble at the beginning of the second half could easily have been punished by a stronger or more determined team. Fulham did not look like a side destined to remain in the top flight beyond the next couple of months. The home fans had their first taste of what Brendan Rodgers may bring to the club. The first half was extremely promising even though the opposition was very poor. It has been a while since City have scored three goals at home. This was a game where the goal difference could have been improved even more but most fans went home happy. Leicester: Schmeichel, Pereira, Evans, Maguire, Chilwell, Ndidi, Gray (Okazaki 70), Maddison (Mendy 79), Tielemans (Ghezzal 70), Barnes, Vardy. Subs not used: Ward, Morgan, Iheanacho, Fuchs. Fulham: Rico, Odoi, Nordtveit, Ream, Bryan, Chambers, McDonald (Vietto 82), Babel (Seri 67), Cairney, Sessegnon (Ayité 46), Mitrovic. Subs not used: Le Marchand, Christie, Zambo Anguissa, Fabri. The first game with Brendan Rodgers in charge failed to herald the revolution that was anticipated. The new formation was apparent with three central defenders and Ricardo and Chilwell as the out and out attacking wing backs. With the two wing backs not at their finest defending, this was a formation that many felt that Claude Puel should have tried previously. 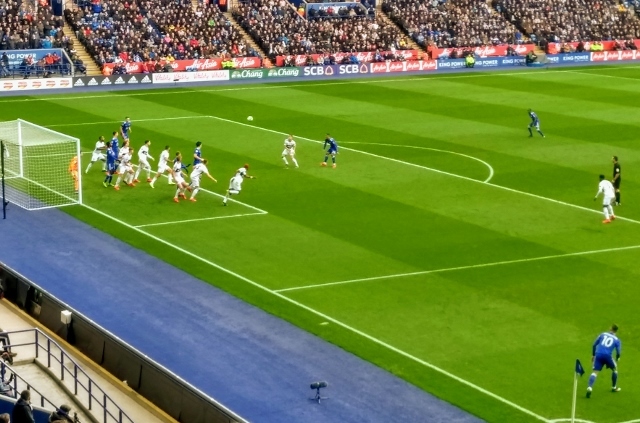 However, playing as full backs, and attacking, the two had always had options afforded by wide midfielders, today they were mostly on their own with little support and, often, having to check back or play sideways in order to retain possession. The lack of movement, particularly up-front was also noticeable which left the midfield and wing backs with limited options. Whilst the system that Rodgers wants to play is obvious, there is clearly a lot of work required on the training ground before it is perfected; early days these. City lined up with Captain Wes Morgan back in the team as the third centre back, no surprise given Rodger’s recent comments about Morgan having a part to play; the man replaced was Gray. City kicked off defending the Vicarage Road end where their supporters were housed. Indeed, City started well with good possession although not really using it to their advantage, this was to become the pattern for the day. 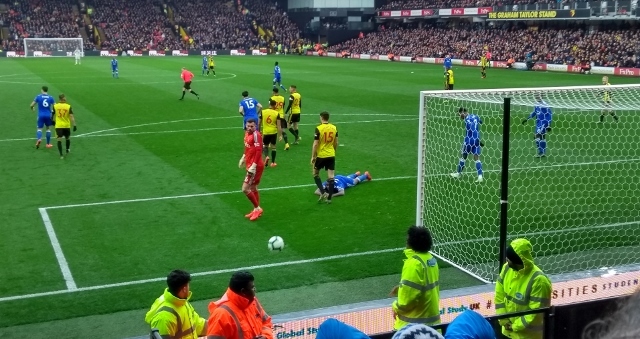 In the third minute Ndidi gave away a free kick on City’s left, the ball into the area caused some panic and Schmeichel made a sharp save from Mariappa and the ball was eventually blocked by Morgan, from Deulofeu’s follow up, for a Watford corner kick. The ball from the corner was worked wide by Watford who continued to attack, a foul by Maguire went unpunished for several seconds before referee Moss brought play back and awarded the kick after Watford gained no advantage. 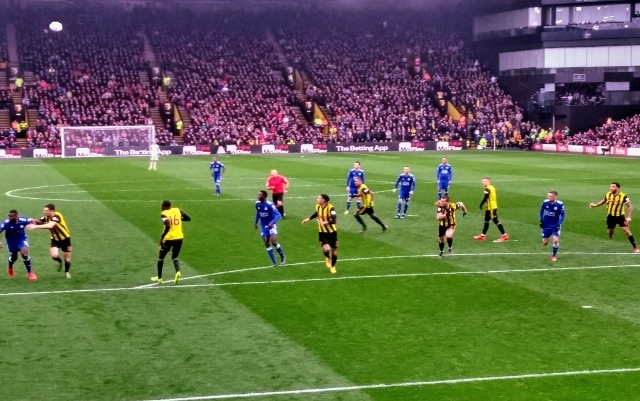 The free kick was swung in by Deulofeu and Deeney headed in from about 5 yards. The City defensive organisation was shocking with Maguire, the tallest at the far post, Morgan and Evans no where to be seen in the middle and Schmeichel far less than dominant. City then assumed control of the game without really threatening. Two quick incidents involving Vardy of note. In the first, after 12 minutes, he robbed Mariappa only to be brought down when he would otherwise borne down on goal. With the City fans, and some players, baying for red, Moss brandished the yellow card. From the resultant free kick, both Vardy and Foster, totally committed, crashed into each other and both needed lengthy treatment. A few minutes later and a fierce cross from Chilwell was volleyed just over by Barnes. The play then ebbed and flowed without any major chances. 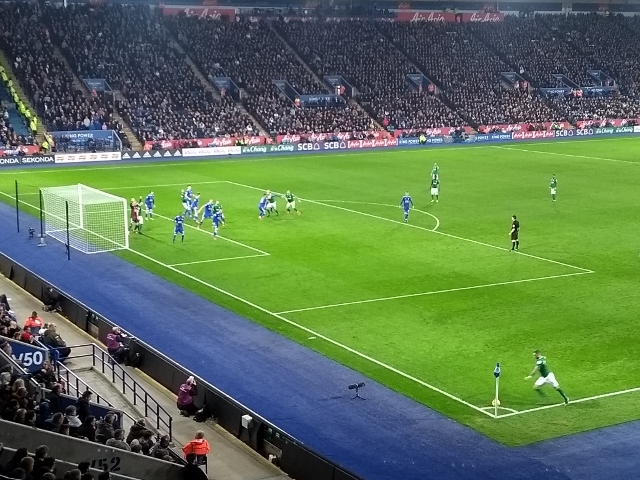 The second half continued in the same manner without any significant improvement, some City fans were getting frustrated with the amount of passing, lack of progress and slow tempo, reminiscent of Puel’s style. 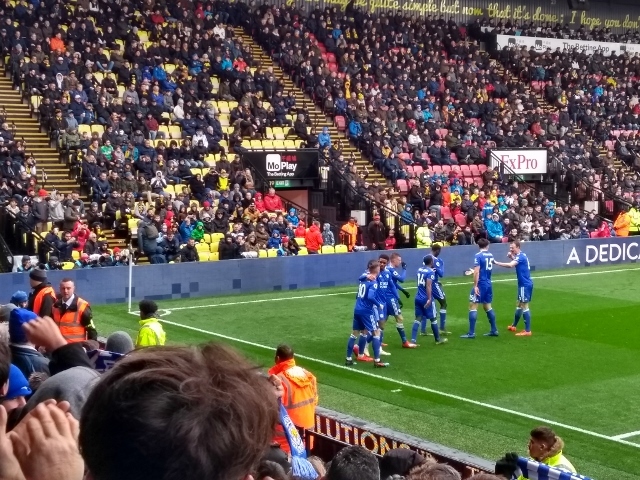 It was as late as the 75th minute when Leicester drew level; Maguire appeared to foul Deeney as he won a header just short of halfway, the ball broke to Tielemans who was allowed time to slip a pass in behind Watford defence where Vardy had made his run and the striker was able to lift the ball over and wide of the advancing Foster to make it 1-1. An excellent goal. It was all City now although Vardy (limping) and Tielemans (tiring) had to be replaced by Iheanacho and Mendy. Maddison put Iheanacho through who with more confidence may have gone through on Foster’s goal. Chilwell was getting good space down the left and made several crosses of variable degrees of accuracy. Deep into added on time disaster struck for City. 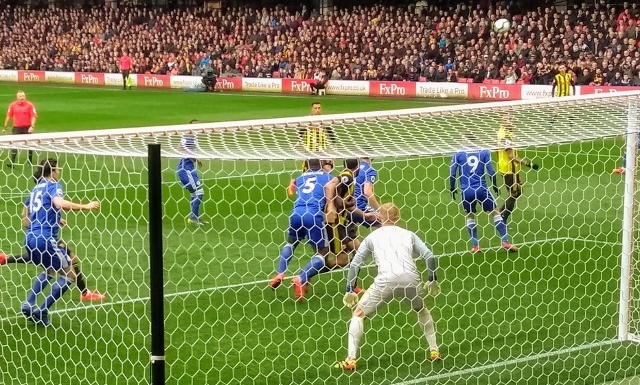 Schmeichel made a hash of a clearance, not for the first time, the ball was sent back and Deeney played a great ball into Gray (Andre) to control and fire past the City keeper and secure the points. No doubt City deserved more, they had 60% possession but were not positive enough with it. Tactics are clear but the lack of movement and support for the wing backs was evident. The pace of the game needs to be brisker and certain to improve. The young guns still need a lot of work and need to be physically stronger, Maddison and Gray most noticeably were eased out of the game by some robust Watford play – the Hornets recorded five bookings or robust challenges. The knowledge of the players that Rodgers will gain over the games until the end of the season will be invaluable and help him define the summer recruitment. Tactically the first signals of the revolution were seen, hopefully the full-blown salvos will be seen in the next few games. 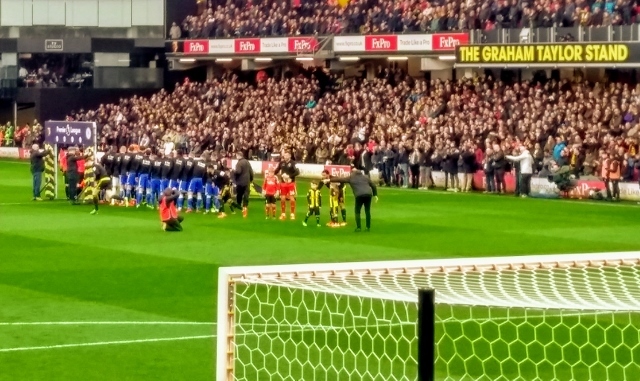 For Rodgers, who has had serious criticism and abuse from North of The Border, and again today from the Watford fans who he walked out on for Reading, the haven of the King Power next week will be a more comfortable experience and hopefully may herald in the new era. Watford: Foster; Janmaat, Mariappa, Cathcart, Holebas; Hughes (Cleverley 90), Doucoure, Capoue, Pereya; Deulofeu (A Gray 68), Deeney. Subs not used: Gomes, Success, Masina, Quina, Kabasele. 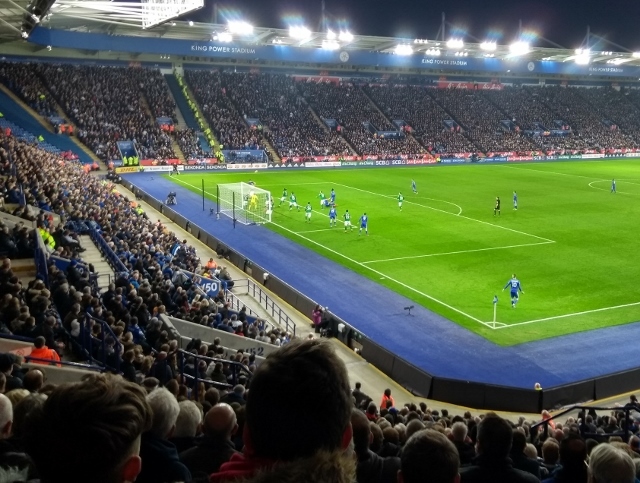 Leicester City: Schmeichel; Evans, Morgan, Maguire; Ricardo, Ndidi, Tielemans (Mendy 82), Maddison, Chilwell; Barnes (D Gray 65), Vardy (Iheanacho 82). Subs not used: Ward, Soyuncu, Fuchs, Ghezzal. Join the M25 and follow until Junction 20. Exit and follow signs for Hempstead Road, follow Hempstead Road into central Watford. Follow the large roundabout system at the end of Hempstead Road and exit towards Rickmansworth A412. Follow this road for 1/4 mile and turn left at the end of the underpass. Go through two traffic lights and turn left into 'The Hornets' at the East end of Vicarage Road. Alternatively the following is advised- Leave the M1 at Junction 5 and take the A4008 into Watford. If on nearing the town centre you can't see it on your left, just go around the inner ring road and you will soon spot it. Join the M25 and head north past M4/Heathrow, then past the M40 Oxford Exit at Junction 16. Take the exit at Junction 18. The slip road goes up to a bridge going across the motorway, turn left towards Rickmansworth. Head down into Rickmansworth until you arrive at a large roundabout near Rickmansworth BR station. Turn left here along the A412 towards Watford. Follow signs into Croxley Green. Continue straight over at the two roundabouts past Croxley, then take the fifth right exit on to Harwood Road. Continue straight down, heading straight over the traffic lights, until you come to the end of the road. At the end turn left and you will now be on Vicarage Road, continue for a few hundred metres and you will see the ground on your right hand side. 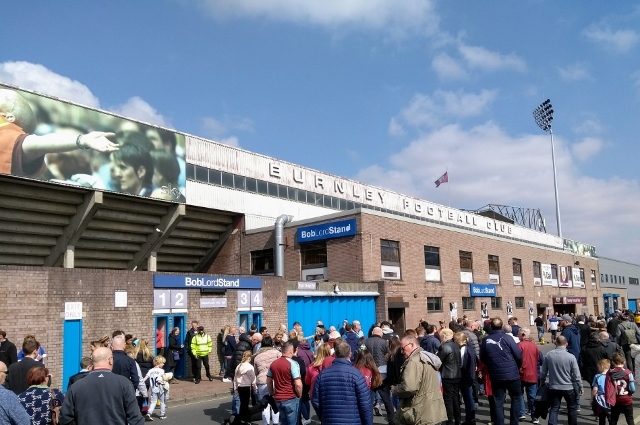 There is no parking available for fans at the ground and street parking is exclusively restricted for local residents by way of matchday permits. Parking is not permitted in Watford General Hospital. Watford town centre has several car parks, the easiest of which for access to Vicarage Road is Church Car Park on the inside of the ring-road, opposite the turn-off into Vicarage Road. All town centre car parks are within a ten minute walk of Vicarage Road. Other possibilities are Watford Grammar School for Girls and Cassiobury Park Avenue, Laurence Haines School (further down Vicarage Road past the hospital), and Fishers Industrial Estate off Wiggenhall Road. Leave the station and take the main road straight opposite (Clarendon Road) all the way over the Ring Road at the lights and up to the High Street. Turn left and go past the Wetherspoons (Moon under Water) on your right and then take the first right after 100 yards into Market Street. Continue along again crossing Ring Road to T junction and then left at the chip shop. Vicarage Road is the next right turn. Please check the cost and times of trains etc. All information is provided in good faith but the Foxes Trust cannot be held responsible for any errors. Brighton arrived on the heels of Claude Puel’s weekend dismissal with City having not won since New Year’s Day at Everton. Mike Stowell and Adam Sadler took charge of the team but media outlets throughout the day were reporting Brendan Rogers would be our new manager. Many mobiles were at the ready in Raw Dykes Road en-route to the game as fans scanned news outlets for information. About an hour before kick-off Rogers’ appointment was confirmed. The fast-moving narrative reflected City’s quick response to the recruitment process. Birch introduced Rogers to the fans and the new manager, in the directors box, was given a warm and enthusiastic reception. Thoughts turned to the game. Home results have blighted City for two consecutive campaigns. This season had seen only 14 points at the KP from a possible 42. Fans turned up in the hope of seeing City on the front foot, providing excitement, pace, goals and three points. At least – that’s what this fan wanted. City made a good start. 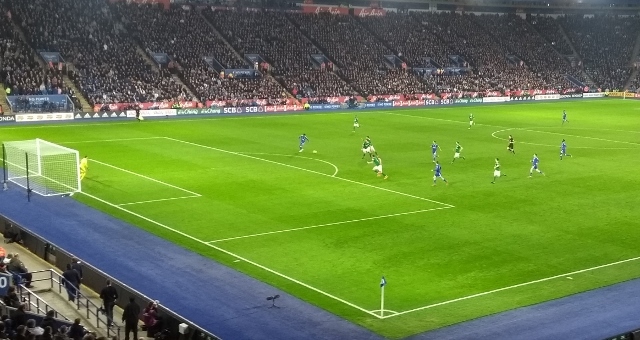 In the early stages Vardy, Barnes and Tielemans each had shots blocked. It was no surprise when City took the lead in the tenth minute and what a good goal it was. Knockaert dallied on the halfway line and a triumvirate of Ndidi, Madison and Barnes bushwhacked him. Barnes played the ball to Tielemans who surged through the inside right channel before playing a superb ball to Gray. The winger steadied himself and fired fiercely into the net past goalkeeper Ryan. Two minutes later Gray could have had a second from a Chilwell pass but Ryan smartly saved the winger’s well- struck effort. For Brighton Duffy headed a good chance over the bar from a corner but the tide was with City. Barnes and Maguire missed opportunities. Barnes was giving Montoya a real examination: so much so the defender picked up a yellow card for pulling back the youngster. Up till now City had looked good value for their lead. The pace of the front men and the quick one-touch passing from midfield were easy on the eye and creating chances. But the high tempo did not last. Some of the City passing became careless: over or under hit or misdirected. Some problems were self-inflicted with too much passing deep in their own defensive third. Sometimes there is nothing wrong with simply giving it a welly. Brighton started to gain a foothold forcing corners and building some pressure. 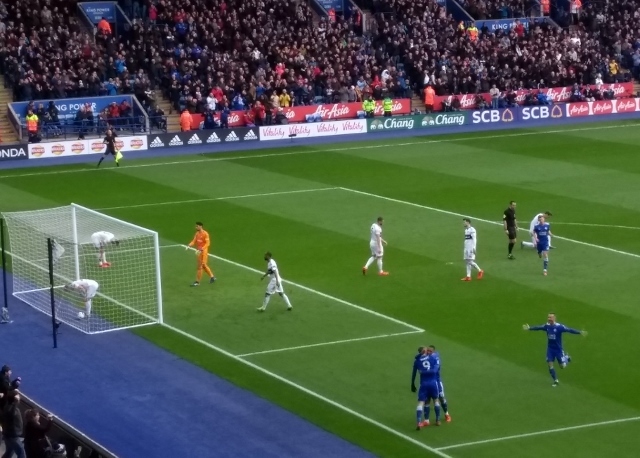 Schmeichel had to be very alert to tip a deflected and dipping Gross effort over the bar. Then former Fox Knockaert swept in a fierce shot from around the penalty spot and Schmeichel again saved City with a top stop diving to his right. 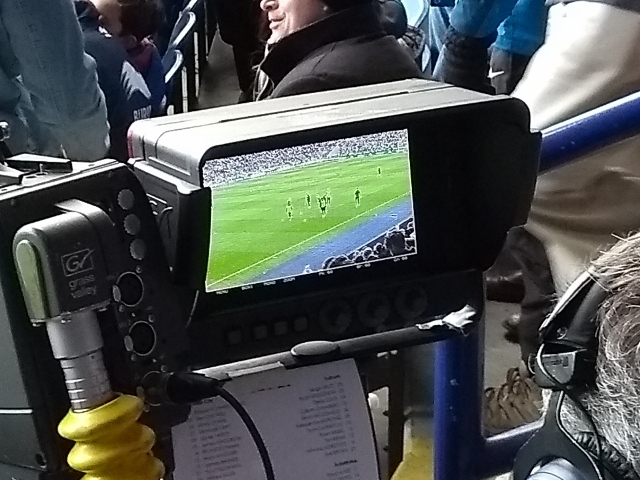 Although Ricardo managed a shot before the interval there was a sense of restlessness among the fans as City seemed to be losing a firm grip on the game. 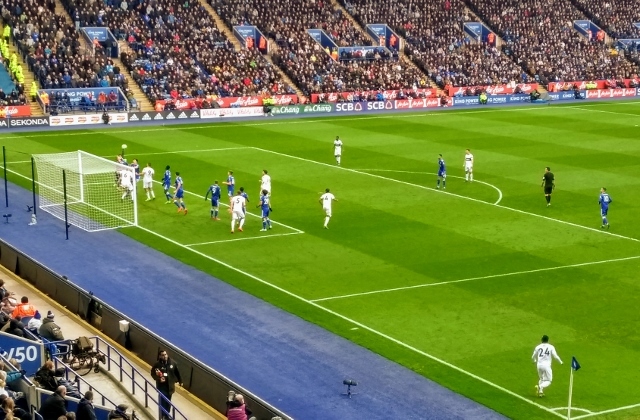 At the start of the second half a good City move saw Vardy head an inviting cross from Gray wide of the post with the goalkeeper nowhere to be seen. Then slick Brighton approach work carved out an excellent chance for the usually reliable Murray but he hit his shot over the bar from in front of a gaping goal mouth. Stephens had a strong drive blocked in the City penalty area. Brighton kept up the pressure winning a succession of corners but the City defence remained strong. Even so City players and fans alike were relieved to see a rasping drive from substitute Bissouma fly just past the upright with Schmeichel scrambling across the goal. Duffy then sent another chance wide. At this point it seemed that Brighton carried the bigger goal threat but it was City who scored next in the 63rd minute. The goal was reminiscent of the counter attacking play from the title winning year. Aggressive pressing in midfield led to Gray breaking with the ball. He fed Maddison who rolled a nicely judged ball forward for Vardy to run on to and bury his shot in the corner of the Brighton net: City two nil up from two quality goals. It was a trademark JV goal and great to see. But if we thought it was time to relax we were wrong. 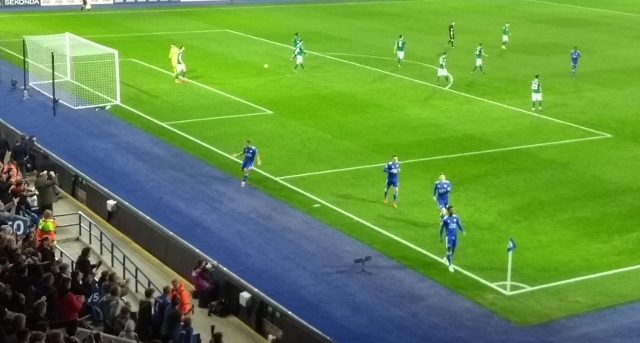 Back came Brighton immediately with Duffy heading a Knockaert corner wide. Then Pröpper strode confidently into the City area and scored with a strong shot past the diving Schmeichel. Stowell tightened things up bringing on Mendy for Tielemans. Many of us were baffled by this given Tielemans’ excellent distribution up to that stage but what do we know? Mendy went on to have an influential 20 minutes through interceptions, keeping possession under pressure and generally bringing some stability to the team. City looked dangerous on the break. Barnes’ energy was astounding as he kept making long runs down the left flank. But too often the final ball went astray or the shot went wide. At one stage Maguire strode forward beating man after man with a series of feints and step-overs. This run from the “Chesterfield Beckenbauer” deserved better but no City player could reach his pass across goal. Brighton kept pressing and the City fans were edgy. A yellow card foul by Vardy gave Locadia a free kick chance but his attempt came back off the strong City wall. Then in the 88th minute another chance fell to the unmarked Murray but he sent his shot into the side netting. 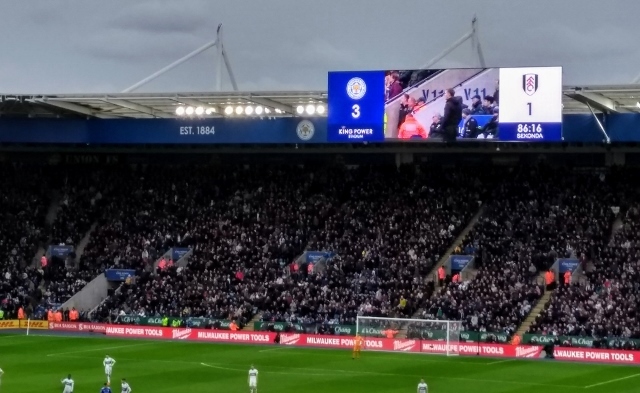 The nerves of the home supporters were exemplified when there was a disbelieving exclamation of “FIVE!” all round the ground when the 4th official showed five minutes added time. Meanwhile Barnes kept running and running including one 70 metre lung bursting effort in over time. Leicester took off Maddison and Vardy for Okazaki and Iheanacho. There were lots of anxious looking at watches but it seemed Brighton knew the game was up. City managed to keep possession for most of added time to secure a welcome and hard fought victory, but one that was deserved. This was a good game for the new manager to see. It was a reminder that there are few “soft” games in the Premier League. He probably would have approved of Leicester’s young contingent showing plenty of pace, inventiveness and determination. The team dug in and weathered Brighton’s efforts. But he would have seen where development is needed regarding decision-making, better composure in the final pass or shot, and reducing unforced passing errors. Reportedly he’s told the players there are “special things on the horizon.” Let’s wish him and the players well in reaching that horizon.